It has distinctive character, undeniable power and represents a deliberate break with traditional watch design principles. A unique piece designed for Only Watch 2011, the Only Watch L.U.C Engine One Tourbillon is powered by an exceptional “motor”, proprietary L.U.C Calibre 1TRM. Machined like an engine block and mounted on silent-blocks, this mechanical hand-wound tourbillon movement was designed, developed and produced at Chopard Manufacture. In 2010, to celebrate Chopard's 150th anniversary as well as the decades of passion it has shared with the world of motor sports, the Geneva-based brand introduced the L.U.C Engine One Tourbillon model combining the finest elements of the two forms of mechanical expression. 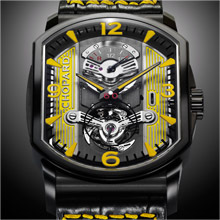 In 2011, at the occasion of the annual Only Watch Charity Auction to benefit research on Duchenne muscular dystrophy, Chopard releases a special black and yellow-toned version of the now famous automobile spirited timepiece. From its strong lines to the most subtle details, everything about this powerful timepiece honours the automobile traditions. The L.U.C Engine One Tourbillon model houses a proprietary mechanical hand-wound tourbillon movement, L.U.C Calibre 1TRM. In much the same way as a car engine, this movement is mounted on silent blocks – that absorb shocks – and held by three lever arms inserted into the case middle. This L.U.C Calibre 1TRM designed, developed and produced by Chopard Manufacture beats at a cadence of 28,800 vibrations per hour and boasts a 60-hour power reserve. Chronometer-certified by the COSC, a sure token of reliability and precision, this tourbillon movement drives displays of the hours, minutes, seconds and the power reserve. 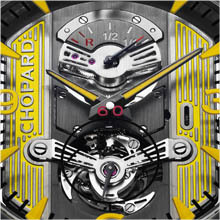 In keeping with automobile traditions, the reamed engine block bears the Chopard signature; while a circular segment directly fixed to the upper face of the movement   carries the power-reserve display at 12 o'clock positioned opposite the tourbillon bridge at 6 o'clock featuring a design that is a first for Chopard. Representing a magnificent mechanical feat of engineering, the L.U.C Engine One Tourbillon Only Watch is distinguished not only by its high-end motorisation, but also by its bodywork that endows it with an inimitably sophisticated style. The DLC titanium case is water-resistant to 50 metres and features alternating polished and matt finishes; it also carries slightly curved lugs screwed onto the case that enhance the overall dynamic effect. Streamlined like car wings, these lugs ensure excellent wearer comfort and a perfect fit on the wrist for the opulent 35.4 x 44.4 mm case whose side is engraved with the “Only Watch 2011” mention. The dial is also inspired by the automobile world and plays on the theme of transparency. The new Arabic numerals characteristic of the L.U.C collection and the hour-markers are engraved and yellow-tinted beneath the glare-resistant sapphire crystal. The hand-sewn black alligator leather strap setting the perfect finishing touch to this model is enhanced by four reinforced inserts evoking the seats of classic racing cars. • Case in polished DLC (Diamond Like Carbon) titanium, length 44.40 mm, width 35.40mm, thickness 10.90 mm.